With a heaping library of haunted things, Hallows Eve conjures up creepy scenes. A graveyard makes for a scary sight, Ghosts and ghouls will give a fright, Jack o lanterns flicker with doom, Bats and fog scenes packed with gloom. A full moon dropped in the sky above, will bring you close to the one you love! So before Halloween sweets are no more, Celebrate with Hallows Eve at the JixiPix Store. Happy Halloween! In the spirit of Halloween JixiPix presents a fun way to create spooktacularly creepy scenes with your photo. Start by selecting an eerie scene from the included presets or hit the randomize button for unlimited frightful toning effects. These dark thrilling effects combined with haunted Halloween objects are sure to send shivers down your spine leaving you screaming for more. When you are done conjuring your ghostly scenes, share your Halloween spirit with your friends. You can even add a HAPPY HAUNTING from the library of objects then send your spooky creations as an e card. If you love Halloween as much as the folks at JixiPix, it will be a sweet addition to your bag of FX tricks. 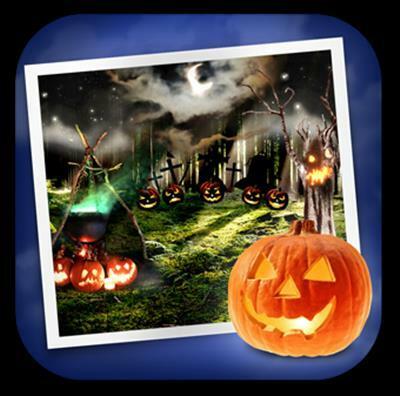 Spooky Halloween scenes that you create with your photo by placing scary-fun mix and match objects from a library of skulls, jack o lanterns, ghosts, tombstones, glowing eyes, ghoulish hands and more. Hallows Eve combines thrilling dark photo toning with misty clouds as a backdrop for scary objects. 18 One touch pre-arrranged Halloween scenes. Once they have been placed on your photo go ahead and resize, move or replace them to create your own custom scene.